Halifax EMC and Roanoke Electric Cooperative recently sponsored the fourth annual Roanoke River Valley Education Consortium’s (RRVEC) Robotics Tournament. The event, held at Halifax Community College, was the culmination of big brain power from local students, as their teams were challenged to complete as many of the 14 robot missions as possible using robots they’d spent the last several weeks designing. Each team was given a robot “brain” and Lego pieces to use in designing and building a custom robot to perform complex tasks, according to rrspin.com. While they were designing their robots, the teams also worked on research projects based on themes in the areas of science, technology, engineering and math (STEM). This year’s event was the largest to date, with 12 teams taking home 13 trophies. The combined teams of Willis Hare Elementary and Conway Middle Schools (the “Roboticians”) won the overall champion award. 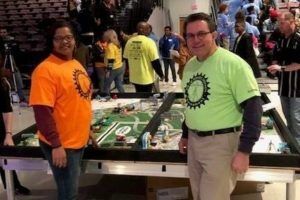 Roanoke Electric’s Patrice Jordan (left) and Halifax EMC’s Brady Martin stand in front of a robotics board where teams tested their creations.